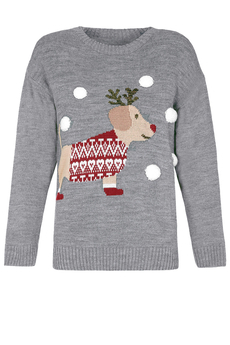 Christmas Sausage Dog Sweater will add fun and a quirky twist during the festive season. With a cute dog wearing her favourite Christmas jacquard sweater and adorned with sparkly lurex antlers and pom pom snowballs. In a relaxed fit, is soft-in-touch, featuring crew neck-line, long sleeves and ribbed edging. It simply slips on and is approx. 62cm in length. Composition: 100% Acrylic. Color: Grey.